FPU: None in LC040, Internal in full 040s. Ram Type: Does not support the addition of memory. The A3640 was used as the standard processor card in A3000T's, A4000T's and A4000's shipped with 040's. There are three revisions of this card in common use. The A3640 does not have provision for installing memory directly onto the accelerator, however a 3rd party product called the X-Calibur provided this feature. At least some A3640s suffer from a serious bug that can drastically reduce the life of the accelerator. Three capacitors on the board were soldered in the reverse position which can cause them to leak electrolyte over a period of time. These capacitors are labelled C105, C106 and C107. You can verify this by locating position U103, just below the oscillator. Vcc (5V) and G(nd) should be printed on the device. Check using an ohm meter for a connection between VCC and the black side of the capactors, similarly check for a connection from G to the other side of the capacitors. This revision will not work in A3000's at all (unknown if this also applies to the A3000T and A4000T) because of a conflict with the DMA handling of the onboard SCSI controller and some Zorro cards. Although it will work with A4000's. A bug in the design allows the board to grant DMA access to more than one device, causing the machine to hang. There is also a problem with the STERM* signal that can cause sporadic crashes with some cards such as the Cybervison 64. The PAL or GAL chip located at U209 should be -01. 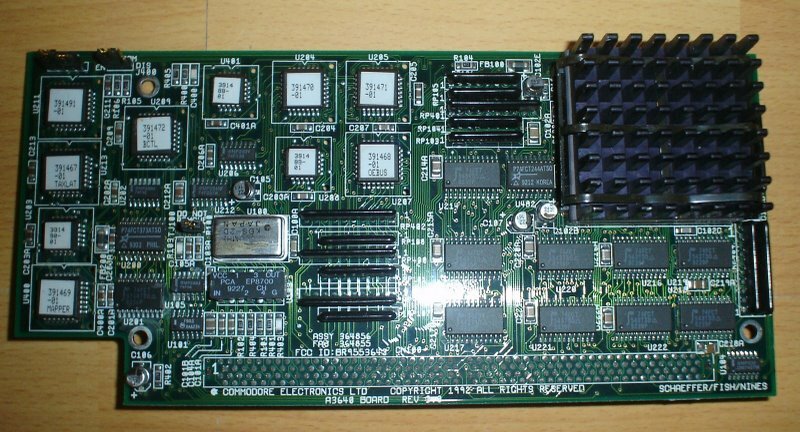 This card works fine in general however it does have a bug related to Zorro II DMA that causes some cards like the GVP Phonepak to stop working, when installed in an A3000. The PAL or GAL chip located at U209 should be -02. No known problems. The PAL or GAL chip located at U209 should be -03. Though the size of the A3640 board fits perfectly even in the small A3000 desktop case, you can have some problem with the height. The earlier A3640s have a large heat sink on the 68040 CPU that would need some room in one of the two floppy drive bays of the A3000. Newer A3640s come with a flat heat sink that fits under the drive bridge without problems. If the heat sink of your A3640 is too high it may be necessary to replace it with a smaller one. One of the reasons why Commodore never recommended the A3640 for the A3000 is heat. 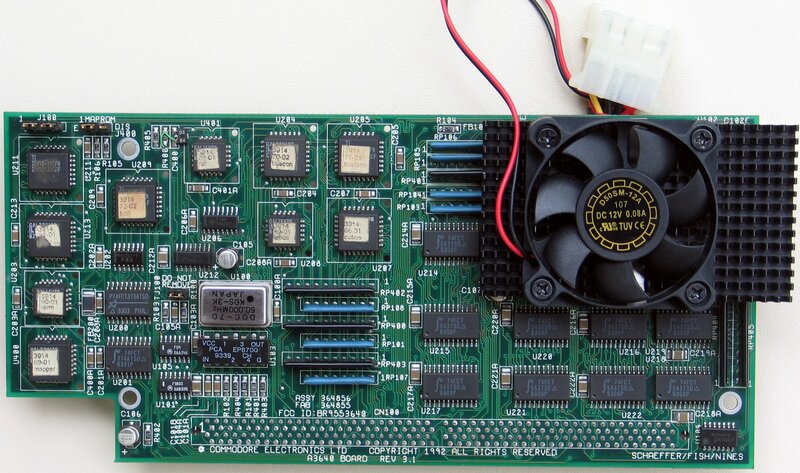 The A3000 was designed to be upgradable with such a board, but the 68040 turned out to run hotter than expected and hotter than the A3000 was designed for. If you use the A3640 in the A3000 desktop, you always risk overheating the 68040 or any other part in the computer. This can cause errors, crashes or shorten the life of certain parts. To avoid heat problems, it might be a good idea to install an additional fan in the A3000. avoid using hot hard drives inside the case and not using it with high room temperatures. The other thing to consider is the version of Kickstart your A3000 uses. If it contains Kickstart 1.4, the pre-boot Kickstart which loads a Kickstart image from disk you cannot use this accelerator, regardless of what version of Kickstart it eventually boots. If your A3000 uses Kickstart 2.04 then you can use this accelerator providing that you have a Ramsey Chip newer than revision 4 and you aren't using Static Column Fast-RAM. There are no known problems if you use Kickstart 3.1.